Scottish nurse Pauline Cafferkey has returned to Sierra Leone for the first time since contracting Ebola there in 2014. She went back to fundraise for children orphaned by the epidemic and to close a chapter of her life. 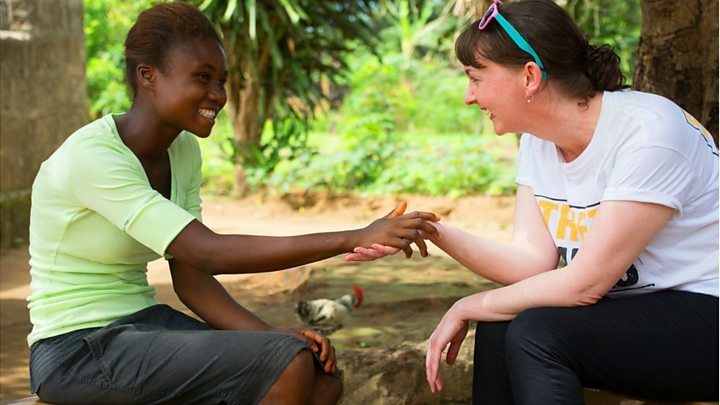 The last time Mbalu met Pauline, the teenager was sick with Ebola and fighting for her life. Pauline cared for her while smothered in a personal protection equipment suit (PPE), when working amidst the crisis gripping the country. The nursing staff had their names written on their suits, so they could identify one another and it is for that reason, and not Pauline's face, that Mbalu, now 17, remembers her. "The first time I saw Pauline, she looked like a devil," Mbalu says, referring to the PPE suit. Now the former patient and her nurse meet again, in an Ebola-free Sierra Leone, at Mbalu's small blue house near Kerry Town, found down a pockmarked dirt road. "It's lovely to meet one of the survivors," Pauline tells the BBC's Victoria Derbyshire programme. "Mbalu must be so resilient. She has so much inspiration that she wants to fulfil. "Coming here and meeting a survivor is important to me. I wouldn't even start to think about the mental health issues that everyone has gone through post-Ebola and during it as well. "There's no way I can compare what I've gone through to what they've gone through." When they're reunited, the pair laugh and banter like old friends, holding hands and cuddling one another. During the epidemic, that kind of physical contact infected about 14,000 people and proved deadly to 4,000. Ebola killed Mbalu's father and sister - the family breadwinners - along with her niece and aunt. She has not been to school for two years, instead finding whatever work she can to feed her family. "I want to be a nurse. Now I want to help others. I see Pauline as a hero, because she risked her life to come to our aid. She has courage." The outbreak of Ebola in Sierra Leone left some 12,000 children orphaned, and 1,400 are currently identified by the charity as being at serious risk of extreme poverty, malnutrition and abuse. During her trip, which she funded herself, Pauline also visited the site of the Ebola treatment centre in Kerry Town, quickly erected by the Royal Engineers as the disease spread. It is here that she and her colleagues cared for the sick and dying, and it's where she contracted Ebola. But when she arrives at the former treatment centre, the large site is nothing but rubble. The buildings were demolished only a few days earlier, to make way for a hospital. She calmly walks around, trying to get her bearings and reflecting on what it was like to work there, wrapped in plastic suits in stifling temperatures and cloying humidity. "The wards seemed quite sombre at times. The only real happiness was when the survivors were coming out and the local staff would do a happy dance for them. "It was good just to see it destroyed. It's a place that doesn't hold good memories for many, many people." Pauline fell ill shortly after she returned to the UK and was later charged with misconduct by the Nursing and Midwifery Council for allegedly allowing a wrong temperature to be recorded in the screening process on her arrival at Heathrow. Although she was cleared, fighting her case stripped her of her life's savings. For the next part of her trip, Pauline travels to Makeni, a large town in the centre of the country. Pauline has returned to Sierra Leone with the charity Street Child, to participate in the UK-based charity's annual marathon. This year's event saw 600 locals and 170 runners from overseas take part. It's here the "the craziest marathon in the world," passes over dirt roads, winding through tropical forests and into remote villages. Pauline has had many health problems as a result of her Ebola, including pain in her legs and numbness in her feet. Despite this, she paid to enter the 10k part of the run, launching an Everyday Hero fundraising page which currently stands at £2,600. She had thought she would need to walk it but gets "caught up in the moment" and runs. "It was great that the community was out encouraging us, pushing us along. It was probably the highlight of the trip," she says. For the remainder of her days in Sierra Leone, she visits more charity projects, sitting down with 12-year-old Mariama, a girl who is being cared for - along with her seven siblings - by her grandmother, after losing her parents to Ebola. Mariama is very shy, but delights Pauline when she murmurs how she'd like to be president of Sierra Leone one day. Pauline says she feels some dissatisfaction with the situation in the country. "I feel frustrated that the Western world has moved on. They've pulled out, the media's pulled out, most of the aid agencies have pulled out. These people are still living with the aftermath." But Pauline is, at least, feeling upbeat about her own prospects. "I'm not too sure what the future is going to hold. I'm pretty positive it's going to be something good. "I'm due something good to happen in my life. I've just got to wait for it." Watch the Victoria Derbyshire programme on weekdays between 09:00 and 11:00 BST on BBC Two and the BBC News Channel.